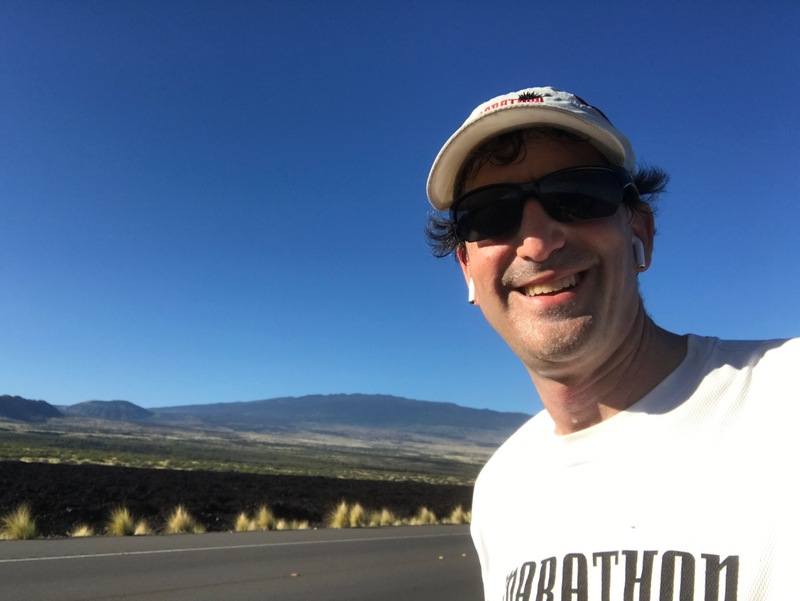 Thank you to everyone who has donated to support my 50th State Marathon (read more here and here). We're still matching donations given this week of my birthday. Click the JustGive logo on the right or just tap here. The triumphant march of Indiana Jones. The mystery of the Force. The strumming guitar of James Bond. The jazzy strains of Mission: Impossible. Those are some of the sounds of music that accompanied me on my 50th State Marathon two weeks ago in Hawaii. Runners and non-runners often enquire about if I listen to music on my runs and if so, what tunes? Yet until now, I have never written much about that aspect of my running. When I began my quest - not for the 50 states but just to reach the of my block, then the end of the street and then to do a full loop to the Palisades bluffs (about 1 mile) - I used the excuse of working out to buy a new iPod. In 2006, I think I acquired an iPod nano. Or maybe the gum stick sized white Shuffle. In any case, I figured I could use my new found cardio workouts to justify technology. Of course, I'll face the music and admit that the weakest of justifications (taking out the trash, walking the dog or even a freshening breeze) might be enough for me. For the first few years of running, but not including my first marathon, I usually ran with some sort of audio. Typically, this has been film music, but my tastes have become more varied although still somewhat eclectic. I've listened to my fair share of Wagner and Verdi operas, numerous pop culture and music related podcasts, some audiobooks, radio plays, Neil Diamond concerts (and lots of U2 ones too). I have even listened to Dodger baseball games and radio broadcast of Arsenal soccer matches. On long runs, I'll often combine many of these and just change as I go. Since I always run with my iPhone, I have no shortage of music. I may be listening to a podcast about an artist (The Answered Question is a great one about music events in Boston), and they'll refer to a composition I've never heard. I'll switch over to Spotify and find the music and then return to the podcast after hearing it. Other favorite podcasts are Rebel Force Radio, Coffee with Kenobi, Jedi Journals, Flash TV Talk, The Arsecast, Supergirl TV Talk and Met Opera Guild podcasts. Of course, I also love the ones I record for - The IndyCast and BondCast. Audible is a great source of audiobooks with full cast recordings (such as The Lord of the Rings from the BBC or the Star Wars radio plays) being particularly enjoyable. I'm currently listening to a complete recording of all of Sherlock Holmes narrated by the amazing Stephen Fry, and he is awesome enough to make all of the voices distinct. Jim Dale is wonderful on the Harry Potter series in the US (Stephen Fry is great in the UK ones). However, for races, I tend to playlists. I have a number of Star Wars ones, and a great Indiana Jones 5k. Or I'll string together a bunch of albums. My first marathon did not have audio on my journey because in the mid-2000's, there was a general movement for race directors to ban listening devices. There were fears that runners would crash into each other or not hear crucial race instructions. Even today, anyone running a big race and looking to have a competitive finish is unlikely to be allowed to use an audio device. For them, the concern is some sort of remote coaching. Today, any prohibitions of normal runners like me are rare. My 50 mile run in Maryland did have this (and 10 hours is a long time without anything to listen to! ), but that was because the Park Service banned the devices as part of the license to the race operators. For my 50th State Marathon, I decided to make a new playlist. Partly, this was to address the issue of my expected slow time. My Star Wars Marathon list is just over 4 hours. I also wanted to have a mix of film music to accompany me. I thought it was appropriate to start with the Hawaii 5-O theme. And why just one? I sequenced the recent show's modern version followed by the classic 60's version. Morton Stevens is the composer. This was a great way to get me moving and reflect the locale and my age. Next, I put in the entire Indiana Jones and The Temple of Doom score. I happen to have the complete score, and I knew I wanted Indy with me. Temple of Doom is my favorite of the 4 Indy movie soundtracks, and it was very hot out. The Temple of Doom felt right in more than one way. Another score that is a good background for me is the 5th Mission: Impossible film (Rogue Nation). (The 3rd and 4th movie scores are good too.) I like the mix of action film interpolating the Lalo Schifrin theme from the TV show. Joe Kraemer may be the least well known of the movie composers (Danny Elfman, Hans Zimmer, Michael Giacchino), but I like his take the most. He worked with Tom Cruise on Jack Reacher, but I have not heard that score. And of course Mission: Impossible was how this felt after a week of trying to get my banged up left hip to work. (Read about that here and here). Glen Nelson and High Adventure are a band out of the east coast, and they do a lot of songs related to fandom. My absolutely favorite of them is The Ballad of Indiana about Indiana Jones. When this song came on at about mile 16, it gave me chills. It was such a pick me up. It's just such a fun song by people who clearly love Indiana Jones. How could you go wrong with a song that starts with something that sounds like a didgeridoo, ends with bagpipes and has these lyrics? "I'm a one man show who is used to flying solo. Ask me how, but I don't know. I'm making this up as I go." That was exactly how I felt! So, I played it twice! Then I was immersed in the world of James Bond. I chose Skyfall by Thomas Newman for this run which may not be the most obvious choice, but it has some great tracks to listen to. The opening Grand Bazaar chase music is a kick. However, as I was ahead of schedule on the race, I actually skipped forward by about half the album to reach a handful of tracks from Star Trek by James Horner and Jerry Goldsmith. We then hit my Star Wars suite starting with the 1977 A New Hope through the Force Awakens and Rogue One. I actually skipped the prequel tracks during my listen - for time and not distaste as I love the music in all 8 theatrical films. Overall, I was really happy with my choices! What's right for you? Some people suggest running with music can throw off your pace, but I've never had that bother me. In fact, if anything, I zone out a bit to the music. And I always take out my earphones when I finish the race so I can enjoy the applause!